The Kuskovo Estate is an architectural and artistic ensemble of the XVIII century located in the East of Moscow. Kuskovo was the summer residence of Count Peter Sheremetev, son and heir of the famous Field Marshal of the Petrine era, the first Russian Count Boris Sheremetev. The main architectural ensemble and parks of the estate were created in about 1750-1770 with the assistance of well-known architects, painters, sculptors and serf masters. St. Petersburg ensembles such as Tsarskoye Selo, Peterhof and Oranienbaum, expressing the advanced ideas of building art of that time, had an influence on the architecture and the layout of the estate. The Kuskovo Estate was intended as an entertainment place. The central part of the ensemble was a big pond with a palace on its northern shore, and the Regular French Park around the palace. Behind the pond the regular park passed into the Landscape Park, which housed the rich menagerie and kennel yard. A characteristic feature of Kuskovo Regular Park was an exceptional harmony of nature and architecture. Each building in the park is the center of a small ensemble. Landscape architecture accentuates the main hotspots of park planning, buildings merge with the green satin ponds, emphasizing their beauty. The theatres were one of attractions of the Kuskovo Park: the Grand Theatre located in the Landscape Park, the Open-Air Theatre — in the Regular Park and the third one — in the Turkish House. There were 230 people of serf actors in the troupe, studying in a special school in Moscow. The Open-Air Theatre located to the North of the Italian House was most interesting one. The theatre was completely designed out of greens. The theatre ceased to exist by the end of XIX century, but its earthen foundation was preserved on which one can observe the outline of the entire structure. The Kuskovo Park was very popular in the XVIII century. At the beginning of XIX century, the Kuskovo Estate, abandoned, fell into decay. There are monuments of architecture of XVIII-XIX centuries in the park preserved to our days: the Wooden Palace (1769-1775), The Hermitage (1785-early XIX century), the Dutch House (1749), the Italian House (1754-1755), the Great Stone Conservatory (1761-1762), the American Conservatory (XVIII century), the Grotto (1766-1768), the Church (1737-1739), the Bell Tower (1792), the kitchen wing (1755-1756), the Swiss cottage (1870), the park pavilions, sculptures, fence with gates, canals and ponds of the middle of the XVIII century, a column with a statue of Minerva (1779), and the Obelisk (1780). 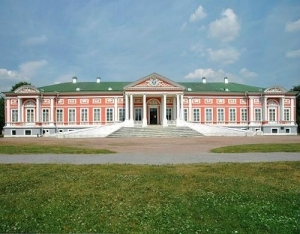 The Kuskovo Museum-Estate is one of the most interesting and most visited museums in Moscow. 114A build. 9 Volzhsky Blvd.